Today in Western Christianity (and tomorrow in the East) we celebrate the feast of The Holy Innocents. Herod the Great, an insecure king of Judea, was fearful of any threat to his throne. When astrologers from the East who had come to pay homage to the “newborn king” Jesus and eluded him upon their departure without giving up his whereabouts to Herod, the king became furious and ordered all boys under the age of two years to be killed. This slaughter puts one in mind of children in war-torn countries today who, though innocent in every way, die each day from violence, starvation or disease. I have rarely, if ever, been as distressed about the plight of the world’s children as I have been in the past year seeing newsfeed of the children who are attempting to flee tyranny and danger. Especially moving to me are the pictures from Syria, recently and most dramatically, those from Aleppo. I carry the images with me everywhere, lamenting my inability to effect any tiny change to the situation. The wonderful thing about this for me is knowing that the Interlink Publishing Group has pledged that 100% of the proceeds from the book sold in the United States will go to fund the food relief efforts of the United Nations High Command on Refugees for Syria. There is a movement to get people involved in this project, found on the website soupforsyria.com. My hope is to organize a soup supper in my town – maybe many! – where the price of admission is the cost of the book that will be available at the event. I read this morning that the book is temporarily out of stock because of the great demand – which makes me happy and gives me time to get organized. A reprint is underway and new orders will be ready to ship in February, so I need to get busy. I know that my efforts will not change the face of the refugee crisis in the world. But I will at least add my small piece to the solution, knowing that some of the Holy Innocents in our world will be fed! Although I have never birthed a child I have, in my years of teaching and then ministering in a parish, come to understand the joys and sorrows of motherhood. I have watched mothers love their children through celebratory days in church and school and family life. I have listened to mothers lament behaviors that they did not understand in the lives and loves of their adult children and on occasion I have suffered with them because I loved their children too. Love has a way of breaking us open both in joy and sorrow, taking us out of ourselves to a greater capacity than we could ever imagine in ourselves. 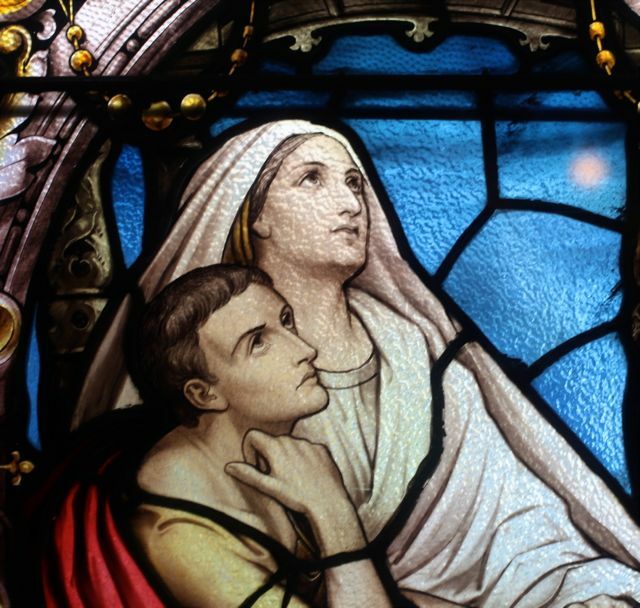 Today is the feast of Our Lady or Sorrows, formerly called by the Church “the Seven Sorrows (or Dolors) of the Blessed Mother.” No wonder so many mothers have devotion to Mary. Just think of what she went through with Jesus! I don’t often think of the everyday life of Mary: the immediate connection that she had when she first held Jesus in her arms, how she felt when he said his first word or took his first step, the pride she must have had as he grew and when she heard him preach…We only have what the gospels and Tradition have recorded for us and know few of her moments of fear for him or her intense grieving at his crucifixion. Can you even imagine her joy and the tenderness between them in their meetings after the Resurrection? There is a lot to imagine and we are able to do so because of our own experiences of such love as she had for her son. So again today I find myself praying for mothers, in all their moments of light and dark, of peace and pressure to “give in,” in all their woe and willingness. I pray that they may know a certainty that I read this morning in a short prayer verse of Thomas Merton: O God of holiness, grant us to seek peace where it is truly found! In your will, O God, is our peace! It seems as if the disciples of Jesus were overly concerned about status because the text of this morning’s gospel (MT 18:1-5) harks back to the conversation that we spoke about on Monday of this week. Then they were talking about who was greatest among their company; today, Matthew recounts their concern about who will be greatest not just here on earth but in heaven! Once again, Jesus speaks of humility by calling to himself a child as an example. Matthew actually give us three pieces of advice in this short response of Jesus. 1.) 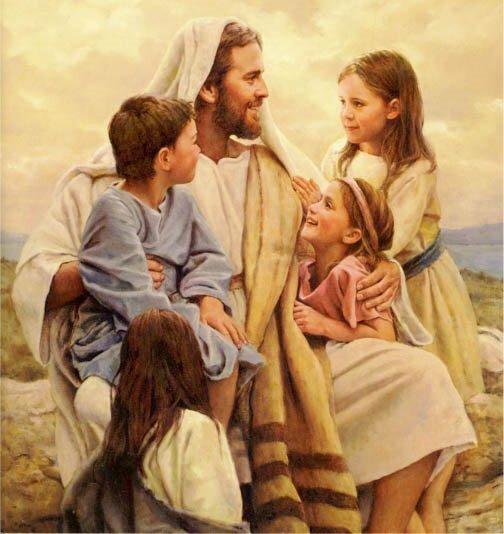 Jesus says, “unless you turn and become like little children…” Turning in a different direction always gives us a different perspective; it is what needs to happen when we pray for conversion, and Jesus says this morning that unless we do it we will not enter the kingdom of heaven. 2.) The second follows the first. “Whoever humbles him/herself like this child will be greatest in heaven.” So it’s not a race to the finish. Everyone who learns how to let go of status or privilege or anything that sets us apart will, it seems, be equal then and nobody will be striving for anything. 3.) It isn’t enough for us to become like children, we have to befriend them. “Whoever receives one child such as this in my name, receives me,” Jesus says. For any of us who have had opportunities to “hang out” with small children, it’s impossible not to learn from their incredible energy, their imagination/creativity and their honesty/simplicity. I guess that could be the purpose of the words of Jesus to us today. If people like that will be our companions in heaven, we ought to get about our preparation for membership in that crowd! It always makes me feel better when I read gospel texts about the less than perfect behavior/conversation of the disciples. Don’t get me wrong! I love to be inspired by their lives, but to know they were just “regular folks” keeps me striving when I do not feel my best self. Interestingly, the gospel this morning is Luke’s version of what we read from Mark yesterday (9:38-43). Luke begins (9:46-50) with recounting a dispute among the disciples themselves, however, and only later complaining about someone else “not of their company.” They were arguing about which of them was the greatest. Jesus realized the intention of their hearts, (i.e. that they were being child-ish) took a child and placed it by his side and said to them…”The one who is least of all of you is the one who is the greatest.” In other words, the goal is to be child-like, not comparing or lording it over anyone but being happy with playing together with whatever toys are around and whoever comes along. 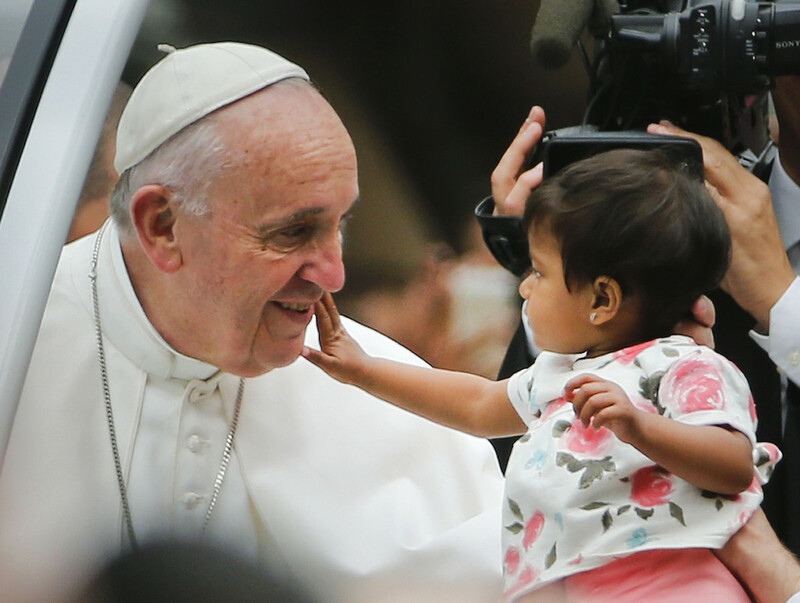 As I consider this, I see in my mind images of young children with Pope Francis this past week, totally delighted and open to him, as he was with them. I pray today for children who are becoming socialized in less positive ways at a younger and younger age, that their innocence and safety might be preserved and that we all might learn to emulate their sincerity and joy at being totally who they are in God’s sight and ours.